New Economist discusses Robert Barro's latest contribution to the equity premium literature over here, and Brad DeLong weighs in as well. As in Marty Weiztman's recent paper "A Unified Bayesian Theory of Equity 'Puzzles'" (pdf) (discussed by Brad DeLong here), the main result rests on a returns density with fat tails - that is, one that assigns larger probabilities to extreme events than what the usual Gaussian 'thin-tailed' distribution would predict. Barro's model (building on Reitz's (1998) article) generates this fat-tailed density by supposing - as in Reitz (1988) - that there is a non-negligible probability of a catastrophic event. In Weitzman's model, agents are continually learning about their environment, and this extra uncertainty generates predictive densities that are fat-tailed, even if the world is Gaussian. Since utility is non-decreasing in consumption, the only way that we can be certain that the tails' contribution will be small is if the density for utility goes to zero fairly quickly outside [u0 , u1]. In this context, it would seem to me that thin-tailed distributions would be preferred to those with fat tails: for a given interval [u0 , u1]. , as the tails get fatter, the distortions generated by using unbounded utility functions and by using densities that are strictly positive for all realisations of utility will get larger and larger. Since expected utility theory hasn't yet been extended to the case where utility functions are unbounded, it's not clear just how we can interpret results that are based on the behaviour of distributions out in the tails, or how robust these results will be to how we specify marginal utility at u0. Gordon, Stephen and Pascal St-Amour, "A preference regime model of bull and bear markets'', American Economic Review, 90 (4), (2000), pp 1019-1033. ________, "Asset returns and state-dependent risk preferences'', Journal of Business and Economic Statistics, 22 (3), (2004), pp 241-252. Last week's Economist had a nice survey on the odd patterns we've seen in the international flows of savings and capital over the past few years. Ordinarily, we'd expect to see savings and investment flow from rich countries (where capital is relatively abundant) to poor countries (where capital is relatively scarce). But that's not what's happening: the world's biggest and richest economy is actually on the receiving end of savings generated by one of the poorest countries in the world. It's as though we were watching water flow uphill. Today China is spending about 1% of its GDP a month to keep its currency from appreciating - it is on track to spend about 15% of its GDP fighting appreciation this year. And unless something changes, it will do the same next year. In the meantime, the US is running a current acount deficit of 6% of GDP, while at the same time running a government deficit of 4% of GDP. Neither of these deficits can be sustained indefinitely at these levels, so the question is how the transition will happen, and how painful it will be. Unsurprisingly, the discussion is dominated by US and European analysts who are concerned with how this will affect them (the Economist survey doesn't mention Canada at all). So I'm going to see if I can figure out what we might expect. 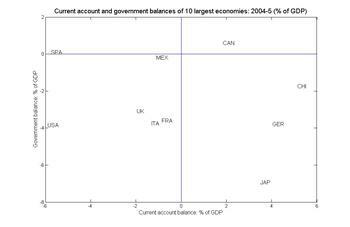 It turns out that Canada's is the largest economy in the world to have surpluses in both the current account and the government balance. That's probably better than being down in the lower-left-hand corner with the US, but is it a big enough cushion? Yesterday, I thought there were only two other Canadian academic economists with blogs: John Palmer's Eclectic Econoclast and Brian Ferguson's Canadian Econoview. But today I'm delighted to add Sandra Peart's Adam Smith Lives! to that list (thanks to Adam Smith's Lost Legacy for the pointer). Why does the past matter? If ideas, like markets, are interrelated, then what we don’t read has implications for our understanding (or lack of) of what we do read. Sometimes, the gap in understanding will be small and unimportant. When it comes to understanding the opposition to economics, this is probably not a safe assumption. If we are ever to engage that opposition in serious discussion – to convince our reading public that, for instance, free trade is not such a bad thing – we need fully to appreciate the origin, influence, and longevity of old ideas and debates. This is an important point. Economists spend most of our time trying to convince other economists, using the tools that economists teach each other: mathematical modelling, econometrics, etc. We make no excuses for that: you can't do serious economics without them. But these tools are virtually useless when it comes time to explain our theories to non-economists. Anyone who is interested in studying the Canadian economy invariably ends up spending a great deal of time poring over productivity numbers. The reason is simple: they stink. And no-one seems to know what's causing the smell. Over the period 1984-2002 (the data are from the OECD, and that's the longest available), Canada's GDP per hour worked increased by 28%. That sounds pretty good, except that it's one of the lowest growth rates in the OECD. In the G-7, Japan (66%), France (52%), the UK (47%), the US (37%) and even Italy (32%) all have higher growth rates in output per hour worked (German reunification makes their data not comparable). Total Factor Productivity (aka the 'Solow residual') measures that take out the effects of capital accumulation look even worse. TFP rose by only 8% in Canada over 1984-2002; Italy (13%) is the only other G-7 country not to have an increase of at least 20%. This is puzzling. Standard growth theory says that sustained economic growth is not possible without technical progress. How does Canada do it? I'll be coming back to this question more than once.